Well, it turns out I'm almost too much of a procrastinator for even keeping up a blog. My only big news for today is that I got bit by mosquitoes 8 times, possibly more. I've seen roaches, weird bugs I don't know, and a big skink. This my friends is why the south is kind of gross. I've been working on a lot of sewing projects that I'll be able to post soon, so that's at least something that has the potential to be mildly interesting. 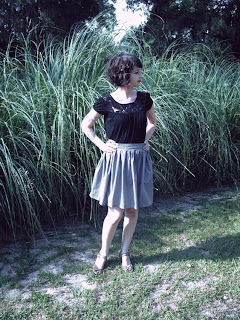 Here is a skirt I made the other weekend. Please ignore the awkward pose and facial expression. 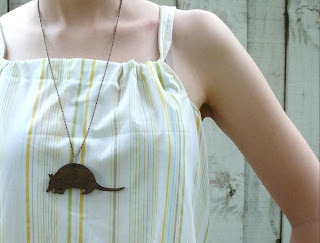 adorable necklaces, how do you make them? and wow, your wedding pictures are fantastic! Thank you so much lauren! 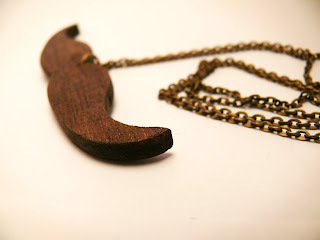 The necklaces are super fun to make, but involves the use of power tools like saws, so it's kind of scary. It makes me feel very manly sawing away in a garage all covered in sawdust though. Very sweet outfit with the lace detail. Your necklaces rock. The anatomical heart is especially cool. Why thank you Clothes Horse. 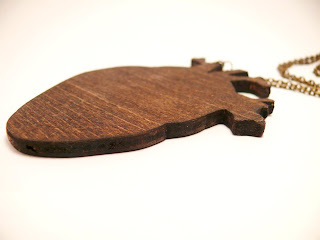 I am obsessed with anatomical hearts, so I'm glad you like that one.